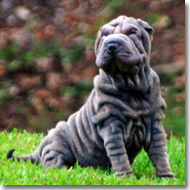 We appreciate your interest in our Chinese Shar-Pei dogs, and are proud to be the breeder of Hawaii’s #1 ranked Chinese Shar-Pei dogs since our breed was accepted for competition by AKC (American Kennel Club) in 1992. 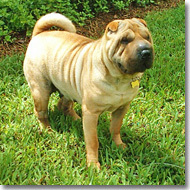 Kauai King Shar-Pei Kennel, located on the Garden Island of Kauai, has been raising pups as family pets, breeding stock and for show since 1985. Puppies ready to go to their new homes have received their puppy shots, been wormed, had their dew claws removed, and been vet checked. Microchipping is available upon request, and is required for foreign travel. All of our puppy litters are AKC (American Kennel Club) registered. 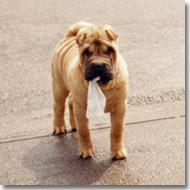 Each puppy comes with a personal health record since birth and an owner’s manual written especially for the breed. Air direct shipping from Kauai is available daily. Shipping within the state of Hawaii is approximately $150.00 to any island, which includes the shipping crate and jet cargo fee. The flight time to Oahu from Kauai is about 20 minutes. Travel time for puppies traveling to Maui, Molokai, Lanai or the Big Island varies from forty minutes to just under two hours. Shipping to the US mainland costs more and is based upon distance traveled — for example, about $450.00 to the west coast (Los Angeles, San Francisco, Seattle, and Portland) and about $500.00 to the east coast (Boston, New York). Air shipping from Kauai to Pacific Rim countries, or other world destinations, is available through both domestic and foreign airlines. Cost varies based on distance traveled — for example, about $500.00 to Guam and the Marshall Islands, $1,450.00 to New Zealand and Australia, and about $900.00 to Viet Nam, Hong Kong, Taiwan, and Malaysia. We also ship to Europe, South America, and French Polynesia from Kauai. Because Hawaii is rabies free there are no quarantine restrictions for travel in the USA. Due to our rabies free status, foreign countries allow Hawaii dogs to be imported with few or no quarantine restrictions. Our puppies are sold on a contract that outlines our mutual agreement, including puppy quality. We accept Master Card or Visa as well as wire or direct deposit and personal checks. For puppies sold out of State or the country, there is no sales tax. Pet quality puppies are offered only limited AKC registration, and will not be eligible for breeding or showing. 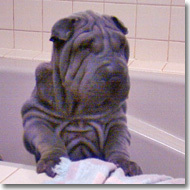 These puppies make excellent companion dogs, however, they may have a fault according to the Chinese Shar-Pei Breed Standard which might prevent them from producing good breeding and show quality dogs. Breeding quality puppies are offered full AKC registration, and may be used for breeding or show purposes. These puppies are correct according to our breed standard in that they have the proper genetic background and structure in order to produce good breeding and show quality dogs. We guarantee our breeding quality puppies to be sound breeding stock, and will replace any who exhibit hip dysplasia by the age of 25 months. 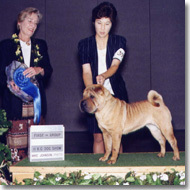 Many of our breeding quality puppies have championed in the AKC show ring. Show potential puppies are offered full AKC registration, and may be used for breeding or show purposes. These puppies are very good quality puppies with no faults at time of sale. We guarantee our show potential puppies to be sound breeding stock, and will replace any who exhibit hip dysplasia at the age of 25 months. In addition, they exhibit proper movement, and the potential to win in the show the show ring. To date, all of our show potential puppies have championed in the AKC show ring. We offer both brush and horse coat puppies for sale. We include fawn, red fawn, black, cream, blue and chocolate dogs in our breeding program so puppies from our kennel can “come” in all colors and both coat types. 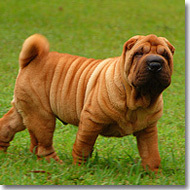 Over the past 30 years, we have bred, raised, trained, and shown almost 500 Chinese Shar-Pei dogs. Always concentrating on health, temperament, and type, we’ve expanded and improved our lines to include the best in the world today. 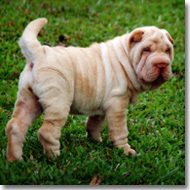 When you’re on Kauai, please stop by Kaluamoa Farms for a visit to Kauai King Shar-Pei Kennel! A call ahead for an appointment assures you of finding us available when you are on the island.